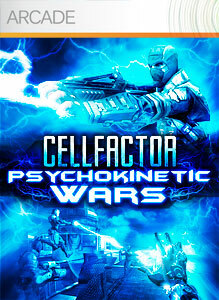 "CellFactor: Psychokinetic Wars is a fast-paced first person multiplayer shooter. Choose your side in the battle of technology vs. humanity. Manipulate your environment and kill your enemies with your choice of gunfire and/or telekinetic superpowers. Use your mind to rip objects from the environment and smash them in any direction or use your powers to create a bullet-proof energy shield. Flying, teleporting, and accelerated speed give you countless ways to kill or be killed. Take on the three single player challenge modes (one mode for each character) or battle live enemies throughout the world in one of four multiplayer modes!"